Hydraulic battery-based pipe bending machine to bend annealed copper pipes up to diam. 22mm and multilayer pipes up to diam. 32mm. 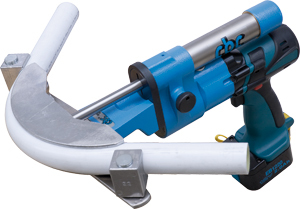 All the accessories of the OB/85S pipe bender and the OB85/KIT can be applied. -	Steel counterformers with die-cast aluminium laterals with quick coupling. 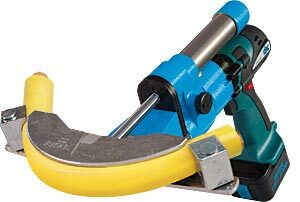 The bender OB85/SB have the possibility to turn the machine body to adjust at every working situation. 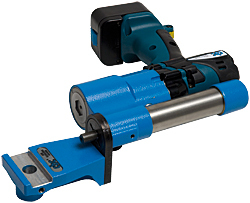 The battery-based hydraulic pipe bender OB85/SB is the ideal tool even to bend copper pipes coated with a PE covering made specifically for the passage of liquid and /or gaseous fuels up to the diam. 22 mm.